Shenzhen Lianrui Electronic Co., Ltd.
LREC7210PF-SFP is a R&D based on Intel controller, support PCI bus, managed gigabit fiber Ethernet lan card to meet the FTTD in Shenzhen Lianrui Electronics CO.,LTD(LR-LINK).The LREC7210PF-SFP is also the unique 32 bit PCI gigabit fiber lan card in market. It also one of the hot sales gigabit fiber nic card of LREC series in Shenzhen Lianrui Electronics CO.,LTD. 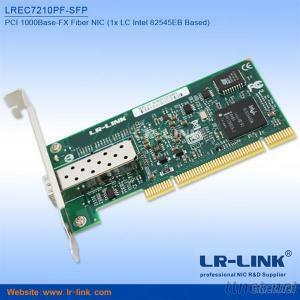 LREC7210PF-SFP PCI gigabit fiber card supports bootrom. It will achieve real-meaning for total fiber Internet cafe, establish the strong hardware basis for Chain of Internet cafes operating companies to achieve premium and high-performance interface cafes. It has been successfully used in government in Guangzhou, Changsha, Tianjin etc. LREC7210PF-SFP uses the Intel 82545EB as major controller from Intel Company. It has more stable, more compliant functions. It is also used in Great Hall of the People, CSIC, AVIC and other large state enterprises and institutions, units and provincial authorities. With a self-configuring PCI interface,delivers high throughput while conserving CPU resources.Enhance server performance further by teaming multiple Server Adapters with Intel’s advanced server feature software for multi-Gigabit scalability and redundant failover capability. With a flexible design that fits almost any type of PCI bus, the standards-based management features and wide network operating system support help to ensure extensive compatibility with the latest server and networking environments. Intel® 82545EB Gigabit Controller provides high performance, reliability, and low power use in a single integrated Gigabit Ethernet controller chip.